Resolutions will be voted on at the 2019 Delegate Assembly. 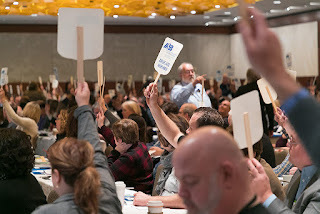 Local school boards are invited to submit resolutions for consideration by the 2019 Delegate Assembly. Resolution forms and information were mailed to IASB member district superintendents and board presidents in early April. IASB’s Delegate Assembly is held each year at the Joint Annual Conference to determine the Association’s advocacy efforts on behalf of its members. Each school board that is a member of the Association is entitled to one voting delegate. Proposals can be submitted by IASB member districts as new resolutions, amendments to current position statements, reaffirmations of existing position statements, or as belief statements. The deadline to submit resolutions is June 26. The IASB Resolutions Committee, consisting of one elected member from each of the 21 Association divisions, will meet in August 2019. After resolutions are submitted, IASB staff will review the proposals and consult with a representative of the district that crafted the measure to prepare background material for review by the Resolutions Committee. Districts proposing resolutions must have at least one board member present at the committee meeting to speak to the proposal. The committee meets to review proposals and recommend ”to adopt” or “not adopt” each measure, and make selections for referral to the full membership at the Delegate Assembly. This year’s committee will be chaired by IASB Vice President Thomas Neeley. Resolution forms and additional information about the process is available by contacting Mary Ellen Buch at 217/528-9688, ext. 1132. A fillable 2019 resolution form and information can also be downloaded from the IASB website.